Ph.D. in Computer Science is a 3 year doctorate level degree certification in the area of computer science and its related aspects and the minimum eligibility criterion for admission is 55% marks in M.Phil or equivalent level in the subject. The course is aimed at providing research and analysis level knowledge and skills to the students in the subject so as to make them well aware of each and every aspect related to the domain of computers science. The fee for Ph.D. in Computer Science course ranges from 10,000 to 2.75 Lacs across various colleges and universities in the country that are offering the course. The variation in the fee is based on the location and type of university that is private/deemed or government. Ph.D. in Computer Science admissions are done on the basis of a merit-list selection process that is the percentage of marks obtained by the candidate at Post Graduate M.Phil or equivalent level. Apart from merit-based process certain colleges/universities take admissions based on the score of some popular entrance exam or conduct a separate exam of their own for admissions into Ph.D. course. One can pursue the course through distance education mechanism in case he/she is working or has the place of residence other than that of the location of the college from which he/she is willing to pursue the course. Those who are looking for funding or fellowship for the course have to fulfill the required eligibility criteria (along with clearing of a respective exam for that purpose) in order to receive the grants. Ph.D. in Computer Science students have a variety of options to choose from in terms of his/her career. He/she can make a start with firms such as software development, hardware manufacturing, Networking, Website management, cloud computing etc. Doctorate students are well equipped with the knowledge and application of the subject and are thus suitable for undertaking various roles at the practical level. A fresh pass out can expect a starting salary of anywhere between INR 21,000 to 25,000 per month. Eligibility M.Phil. or equivalent From any recognized college/university with a minimum of 55% (relaxable for reserved category candidates) marks. Ph.D. in Computer Science: What is it about? Computer science is a wider domain of study which encompasses networking, hardware, digital electronics, software development, website development and electronic circuitry among others. The area of application of computer science has seen an exponential growth since the advent of the 21st century. 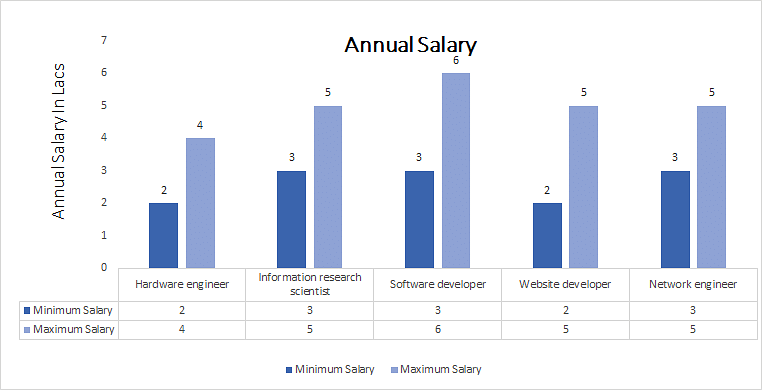 The increasing growth and expansion of computer science has lead to the growth of students opting for academic courses based on the domain of computer science so, as to enhance their chances of employment. Ph.D. in Computer Science provides a mechanism for the students to develop an expertise in the subject by getting into the insight of the domain. Through research, practice, and presentation the course curriculum aims at preparing the students for an overall domain expert who is ready to take on the job market. Ph.D. in Computer Science is offered as a doctorate level program by a good number of colleges/universities across the country to candidates who have passed their M.Phil or equivalent level exam from a recognized state or central University. Students can take admission in the course either through Common Entrance Test conducted by colleges/Universities or by applying to the various institutes offering this course based on their performance at the M.Phil or equivalent level. For your reference, we have tabled down a list of various colleges/universities that are offering Ph.D. in Computer Science course in India. Interested candidates can make an application for admission to the above-mentioned Universities and colleges. Candidate must have passed their M.Phil or equivalent level Examination from a recognized state/private/deemed or central University with at least 55% (45% to 50% for reserved category candidates) in the respective domain of study. He/She shall not be having any backlog or compartment in any of the subject/subjects at M.Phil or equivalent level that is yet to be cleared at the time of taking admissions. Apart from the above-mentioned eligibility criteria’s various colleges and institutes may have their own additional criteria’s which the students would have to satisfy in order to take admission (Like work or research experience in the domain). Certain Institutes grant admissions through Common Entrance Test (CET) like CSIR NET etc. To get admission in these institutes candidates would have to qualify the respective entrance exam by securing minimum qualifying marks. The eligibility criteria’s mentioned above are common to most of the universities and colleges across the country that are offering Ph.D. in Computer Science course to the students. Most Universities/Colleges offer admission based on the score of CET (like UGC NET) or conduct their own entrance test (like JNU) for admission into Ph.D. courses hence students would have to make an application for such exams. After preparation of final merit list, the process of final allotment of seats to the candidate takes place and the candidate is asked to deposit the fee for Ph.D. in Computer Science course and register for the respective academic year. The time duration of the course is variable that is 3 to 5 year and the syllabus is divided into various domain related subject and practical/research modules. The detailed description of the syllabus is tabled below for your reference. Ph.D. in Computer Science: Who Should Opt for? Students who have done M.Phil/Masters in the domain of computer science. Those who have interest in software development. Those who are looking for a career as a web developer. Those looking at a career as a data miner. Ph.D. in Computer Science students have plenty of options to choose from in terms of their career. One can choose to work as Hardware engineer, Professor, Information research scientist, Software developer, website developer, Network engineer etc. To provide you a holistic view of the career prospects of the course we have tabled certain areas and the respective roles attached to the same where Ph.D. holders can look for in terms of their career.